In light of the environmental, social, and economic instabilities affecting the modern human, the project proposes a biotechnologically engineered post-technological vehicle, which could facilitate the long-term survival of a species of human and its evolving culture. The humalga trans-species is a genetic hybrid of the human and the alga. The fusion of the two entities, however, does not result in a mutant morphology. Rather, the partners remain as distinct organisms, connected through a complex life cycle (xenogenesis). The alga, evolutionally one of the oldest and self-sufficient eukaryotes, lends its inherent resilience, autotrophy and asexual reproduction to the trans-species, whereas the human contributes his technological and cultural legacy as well as the intricate mechanisms of sexual selection and reproduction. As an art project, Humalga is loosely mimic the scientific research process including gathering information on the topic of interest, discussion among peers (symposium), connecting to institutions and funding bodies, proposing a thesis, obtaining ethical consent and conducting proof-of-concept experiments whilst engaging the public in every step. Concept and context: HUMALGA: Towards the Human Spore: Reminiscing Algaeis an art and research project proposing an alternative, constructed evolution of the human species. It explores a biotechnologically engineered post-technological vehicle, which grants humans the resilience of simple, undifferentiated organisms while preserving the human phenotype, behavior and culture. Biotechnologically the proposal involves creating a transspecies, the humalga, by genetically hybridizing and modifying the human and alga in such a way that both organisms appear as morphologically distinct living entities, which xenogenetically alternate as sexual and asexual generations. 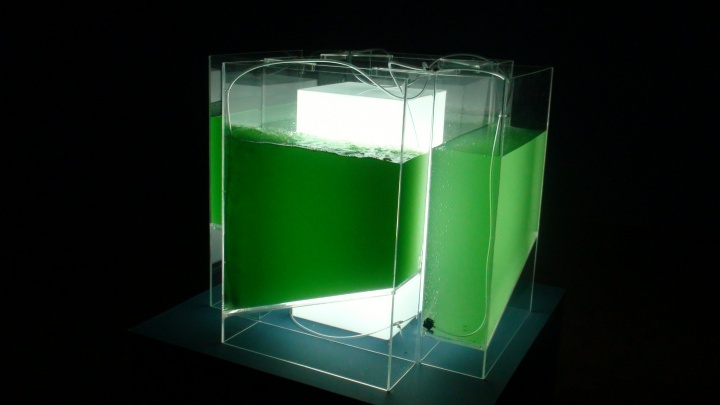 Through wet media installations and theoretical essays the project both examines state-of-the-art and pending technologies facilitating the creation of the novel transspecies with proof-of-concept experiments and, moreover, through its radical position exposes numerous biases and controversies of the present time. Amongst others, it explores the human instinct to survive as a species, assesses the project within the current ecological anxiety, considers the implicated bioethical issues and envisions future scenarios involving the humalga. Concept and context: Humalga: Injection is the second in a series of installations representing the art-research project titled Humalga. The present phase of the project focuses on the mechanisms of biological adaptation and evolution, be it with (breeding, molecular engineering) or without human intervention (natural selection). Central to the art piece is a “wet symposium”. Mediated by the engagement of experts/researchers in the formation of an artwork, we will nucleate a transient cross-disciplinary field terRabiology (terra – Earth, tera (Greek) – monster), which would examine the psychology, physiology and biology of the trans-species humalga. The relevant topics had been moderated by dr. Špela Petrič & Robertina Šebjanič and discussed with Dr. Peter Trontelj (evolutionary biology), Dr. Polona Tratnik (philosophy and biotechnology) and Tea Hvala (sociology and science fiction). Each morning we meet at BioTehna between 11.00 and 13.00. Afternoons had been dedicated to guided discussions between the experts and the public. 17.45 - 20.00 Slovenian Museum of Natural History. Guest speakers: Dr. Peter Trontelj and Tea Hvala. Guest speaker: Dr. Polona Tratnik. 17.45 - 20.00 Glasshouse Tivoli of the University Botanic Gardens. 20.30 Metropolis Gallery/ Gallery Kapelica, symposium conclusion party Locations of symposium. Dr. Špela Petrič (1980), BSc, is currently finishing her masters degree in Transmedia at LUCA in Brussels, Belgium. Her artistic practice combines natural sciences, new media and performance. She is interested in all aspects of anthropocentrism; the reconstruction and reappropriation of scientific methodology in the context of cultural phenomena; living systems in connection to inanimate systems manifesting life-like properties; and terRabiology, an ontological view of the evolution and terraformative process on Earth. While working towards an egalitarian and critical discourse between the professional and public spheres, she tries to envision artistic experiments that produce questions relevant to anthropology, psychology, and philosophy. She extends her artistic research with art/sci workshops devoted to informing and sensitizing the interested public, particularly younger generatiobrns. She is a member of Hackteria. Projects and collaborations/ Humalga: Towards the Human Spore (art-research project, co-author Robertina Šebjanic 2012-), Circadian Drift (installation, co-author Maja Smrekar, 2012), MaSm Metatransformation (collaborator in the project of author Maja Smrekar, 2011), CTCAG recognition (performance, 2011), Futuro autopoeisis (collaborator in the project of author Robertina Šebjanic, 2010), Cladocera (instalation, 2010), Avtobiografija-diskografija (gallery performance, author Samo Gosaric, 2008). Robertina Šebjanič (1975) is an artist, researcher and cultural operator/ programme developer. In her artistic practice is the context for her ideas and concepts often realised in collaboration with other authors, and thus through interdisciplinary and informal integration embodied in her work. Field of her focus are: bioart, interactive ambiental responsive environments, robotic, electronic, video instalations and noise/sound art. She has exhibited solo and group exhibitions and performed at: .//Liwoli_Linz, Gallery Kapelica_Ljubljana, Prima Gallery_Berlin, Gallery SC_Zagreb, Netaudio festival_London, Likovni salon Gallery_Celje. Gallery Akatraz_Ljubljana, Paraflows_Vienna, Haip_Ljubljana, Amber_Istanbul, The Museum of contemporary art of Vojvodina_Novi Sad, Gallery KiBela-Kibla_Maribor, SCCA_Ljubljana etc.. Since 2011 is part of Theremidi orkestra. Aquarium design: Špela Petrič in Robertina Šebjanič Aquarium construction: Scenart, David Pilipovič s.p. The project was supported by the Slovene Ministry of Culture and MOL – Department of Culture.